Project 1013: I. Vea, D. A. Grimaldi. 2015. 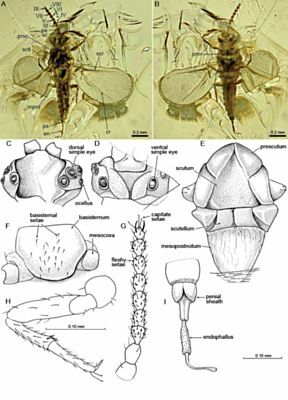 Isabelle M Vea Diverse New Scale Insects (Hemiptera: Coccoidea) in Amber from the Cretaceous and Eocene with a Phylogenetic Framework for Fossil Coccoidea. American Museum Novitates. 3823:1-80. Holotype AMNH Ba-Ve762, alate male in a 5 Ã— 5 Ã— 1 mm square, light orange, transparent polished amber piece; specimen in good preservation with some internal organs visible through transparent cuticle, lying on a layer, with one wing well spread and one folded, white milky layers obstructing some parts, such as the head area; accessible views: ventral and dorsal (fig. 8AB). Baltic amber, Palmnicken mines in Yantaryni, on the eastern coast of the Baltic Sea, Russia. Purchased from Jurgen Velten Baltic amber coll., deposited at the American Museum of Natural History.